Mathematics is very much fun subject. If one understands the basics of mathematics then solving math problems is very entertaining. Understanding mathematics helps us to solve many real life problems. Here in this website you will find many mathematical brain teaser and riddles for all age groups. Some of these math brain teasers are for kids and some are for teens and adults. All these riddles are posted with answers and detailed explanation to solve these brain teasers. 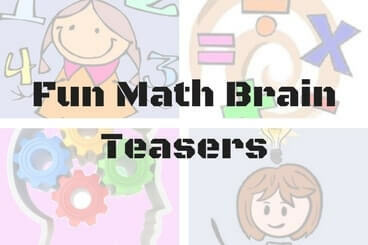 Here is the list and links of these Fun Math Brain Teasers. Do click on the links below to go to corresponding page. I am posting these math riddles in chronological order. It means that latest post appears at the top of the list.